This Wednesday, grab your boots, spurs and lasso cause' a new rider is commin' to town! 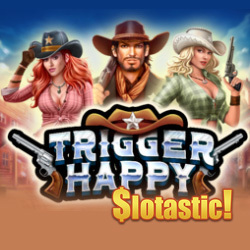 Realtime Gaming's new Trigger Happy western-themed slot game is launching and Slotastic Casino are giving 33 free spins to all players that have made a deposit this year and up to 75 more free spins with your next deposit. Trigger Happy features Redhead Cowgirls, grouped Wilds on reels 1 and 2 and on reels 4 and 5, the Wild Cowgirls are Blonde. Three or more Sheriff's Badge scatters trigger 7 free spins. During free spins, you choose either the Redhead Cowgirl or Blonde Cowgirl to win either additional scatters or additional free spins. Scatters during free spins trigger additional free spins. The Lucky Feature is randomly triggered after any regular spin, awarding 5 free spins. "This is one rootin', tootin' great game!" said Slotastic manager Oliver Smith. "Hot diggity -- with all its grouped wilds and free spins, players are gonna take to it like a horse to oats!" Trigger Happy will be available in Slotastic's download and instant play casino for desktops and laptops and via the casino's free Android App for players using smartphones and tablets. Slotastic is offering a choice of introductory bonuses with various wagering and cash-out conditions. Available March 20-27, 2019 only. Min. deposit: $50; playthrough 60X, no max. cash-out. Min. $25 deposit; playthrough 60X; Max. cash-out $180. Min. deposit $25; playthrough 30X; no max. cash-out. The free St Paddy's Coin Drop game continues at Slotastic until April 7th. You can win up to 232 free spins by dragging cauldrons across the screen to catch Golden Coins and Stars. Get more bang for your buck with another awesome Free Spins week at Juicy Stakes Casino! 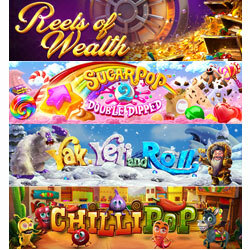 Get up to 100 free spins on some amazing slots from Betsoft just by making a deposit between March 18 – 23. Until Saturday, get free spins on four of Betsoft's best and newest: Chilli Pop, Yak Yeti & Roll, Reels of Wealth and Sugar Pop 2 – Double Dipped. Bigger deposits get more free spins – up to 100 – but the casino is throwing in free spins with even a $25 deposit. Chillipop is a sizzling-hot Mexican fiesta. You mix up a spicy salsa by matching symbols like tomatoes, onions, garlic, and peppers to create the tastiest (and top-paying) combinations. Like the salsa, things heat up quickly. Three or more adjacent symbols pay out and new symbols cascade down to replace them as they're added to the pot. Betsoft has kept all kept the best features of the original Sugar Pop which made it so popular and then added some sweet twists. The new Sugar Pop 2 – Double Dipped has a Jelly Bean Cannon and a Morphing Golden Wild candy that shifts and changes shape to match any candy near it. In the new Yak, Yeti & Roll, an eccentric Inuit and his yeti sidekick make their way across the frozen Arctic as cascading symbols award up to 200X prize multipliers and up to 8 free spins. You'll be Surrounded by gold and jewels in Reels of Wealth. Wannabe billionaires can earn the payday of a lifetime with this game's innovative new Megastar Jackpot mini game. Free spins will be available 24 - 48 hours after deposit. Wagering requirement: 30X. Max cash-out: $250.